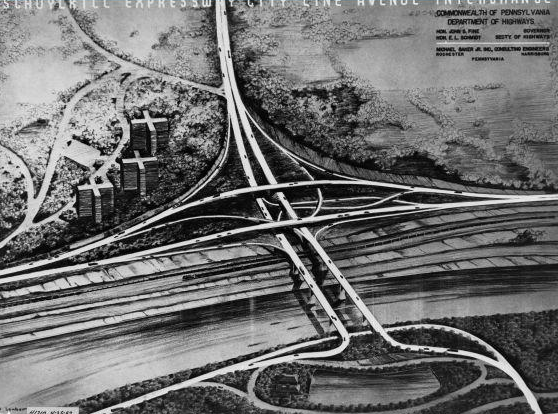 The City Line Avenue Interchange, seen here in a 1952 engineering diagram, was designed with exit ramps on both sides of the expressway, with one direction taking vehicles to City Avenue (the top of this picture) while the other exit would carry vehicles across the Schuylkill River to the East Falls neighborhood. 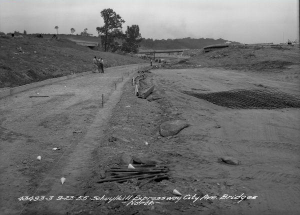 When the expressway opened in 1958, backups arose near the interchange. A redesign and new construction on the interchange in the 1970s created more space for drivers and helped alleviate some of the traffic issues. Constructed between 1949 and 1959, the Schuylkill Expressway required expansive leveling of the uneven terrain along the Schuylkill River. 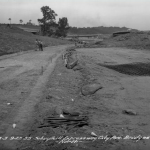 Excavators had to cut into hills and cliffs along the river and fill in natural depressions to create proper elevations for the expressway. The expressway was constructed in stages, with sections near Valley Forge and the Pennsylvania Turnpike opening in the early 1950s. By September 1955, as seen in this image, the expressway near the City Avenue exit was only dirt lanes leveled and reinforced. This section opened to vehicles in 1958. 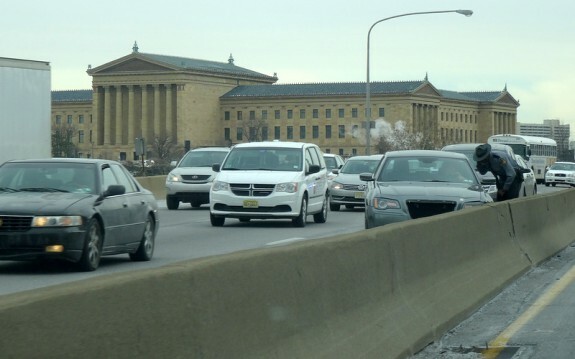 The Schuylkill Expressway, designed to provide a direct route between Philadelphia’s northwestern suburbs and the heart of the city, also takes drivers through a variety of landmarks and landscapes. Drivers heading into the city move from the densely tree-lined section near Gladwyne to the urban-industrial landscape of South Philadelphia. This image looking south in the 1960s shows the highway as it snakes along the Schuylkill River near the Philadelphia Museum of Art and the Fairmount Water Works. Other landmarks such as Boathouse Row, West Fairmount Park, Laurel Hill Cemetery, and the Philadelphia Zoo murals are visible along the expressway as drivers leave or enter the city. 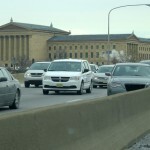 Traffic on the westbound Schuylkill Expressway backs up near the Philadelphia Museum of Art on January 29, 2015, after a minor accident blocked the left lane, resulting in jam that affected both directions of the expressway as well as the westbound Vine Street Expressway that feeds into the Schuylkill. Decades before it was built, traffic jammed the narrow streets of 1930s Philadelphia despite the Great Depression, and later the city’s World War II-fueled economic revival only exacerbated matters. Postwar pro-growth planners and organizations such as the Greater Philadelphia Movement (GPM) and the Citizens’ Committee on the City Plan (CCCP) saw this automobile congestion, together with slums and suburbanization, as draining the city’s lifeblood. Well-engineered express highways, they argued, would save the downtown and help restore livable urban neighborhoods. Highway mania had intensified in 1938 with publication of “Toll Roads and Free Roads,” prepared by the Bureau of Public Roads (BPR). Created in 1916 to free American farmers from the mud, the engineering-oriented BPR in 1938 now advocated a modern urban-oriented highway system that one year later was rendered graphically in General Motors’ “Futurama” exhibit at the 1939 New York World’s Fair. 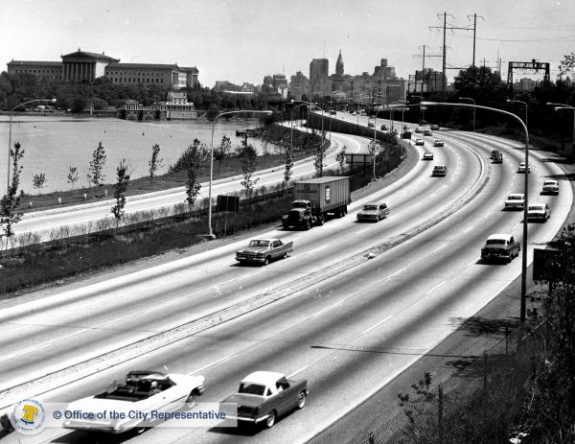 After World War II, Philadelphia boosters rallied behind the idea of modern freeways and pressed for a submerged Vine Street Expressway to relieve congestion from traffic flowing into the city from New Jersey via the Benjamin Franklin Bridge. However, Pennsylvania’s historically anti-urban state legislature, which controlled both state and federal highway funds, quashed the idea. Instead, momentum built in Harrisburg for an east-west arterial highway in 1947 called the Valley Forge Expressway, connecting Philadelphia with King of Prussia and designed to relieve traffic jams on U.S. Route 30, which served Philadelphia’s “Main Line” suburbs such as Ardmore, Bryn Mawr, and Haverford. Talk of such a highway dated from the 1920s and appeared in the 1931 Regional Plan of the Tri-State Regional Planning Federation. By 1941, the year that President Franklin D. Roosevelt’s Interregional Highway Commission proposed a 40,000-mile, federally funded interregional highway system (the Federal Aid System), the so-called Valley Forge Expressway appeared on Pennsylvania’s wish list of modern state highways. Together with the widened and submerged Vine Street and the “Industrial Highway” skirting the Delaware River, the Schuylkill Expressway was featured in planner Edmund Bacon (1901-2005) and architect Oscar Stonorov’s (1905-1970) spectacular “Better Philadelphia Exhibit” in 1947. 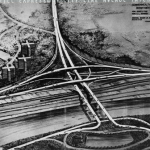 However, while both the Bureau of Public Roads and Edmund Bacon saw the Schuylkill Expressway relieving traffic congestion regionally, north and south of the proposed multilane highway, as well as east and west, Clark, Rapuano, Holleran, Hardesty, and Hanover, the engineering firm contracted to design the roadway, interpreted the 1947 origin-and-destination data to alleviate mainly Pennsylvania Turnpike and Philadelphia-generated traffic volumes. They ignored Broad Street traffic and other traffic flowing from Philadelphia’s burgeoning northeast where Bacon planned garden-city communities. Nor did Clark, Rapuano’s flawed design grapple any more successfully with the topographical obstacles presented by the rugged, albeit idyllic, Schuylkill Valley terrain as it entered the city limits. Against protest, the historic Schuylkill canal locks and sections of Fairmount Park were sacrificed, and the narrowing of the roadway from six lanes to four as the highway approached Thirtieth Street made a bottleneck inevitable, despite frequent and dangerous turnoffs into Fairmount Park. 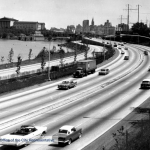 Constructed between 1949 and 1959, much of it before the availability of federal funds derived from the Federal Aid Highway Act of 1956, the original Schuylkill Expressway largely predated modern highway standards. By 1962, fatal accidents occurred frequently, and experts identified ten potential deathtraps. In 1970, with federal funds, the state completely redesigned and rebuilt the complex of on- and off-ramps in the vicinity of City Line Avenue and the Roosevelt Boulevard Extension. In the 1980s, the Pennsylvania Department of Transportation added new lanes and rebuilt shoulders along the entire twenty-mile length of the highway. Long the busiest highway in Pennsylvania, by the twenty-first century the expressway carried 163,000 vehicles daily within Philadelphia County and 109,000 more vehicles daily in adjoining suburban Montgomery County. Its heavy use profoundly impacted the growth of the Philadelphia region. It especially opened the city’s western suburbs to intensive residential and industrial development, making Montgomery County, for example, a center of American pharmaceutical industrialism and boosting one of the largest shopping-mall complexes in America at King of Prussia. That intense growth, plus the traffic from North Philadelphia and Bucks County flowing from the Roosevelt Boulevard Extension of the expressway, daily flooded the highway with commuter vehicles. Thus, notwithstanding several rebuildings, the Schuylkill Expressway in the era 2010-2014 still ranked as one of the most dangerous and congested commuter highways in America. Its historic failings attest to the flawed motivations and assumptions that guided its birth. John F. Bauman is Visiting Research Professor at the Muskie School of Public Service, University of Southern Maine, and the author of books and journal articles on a broad range of urban policy issues. Bauman, John F. “The Expressway Motorists Loved to Hate”: Philadelphia and the First Era of Highway Planning, 1943-1956,” The Pennsylvania Magazine of History and Biography, Vol. CXV, No. 4 (October 1991): 504-533. Rose, Mark H. Interstate: Express Highway Politics, 1939-1989, rev’d edn. Knoxville: University of Tennessee Press, 1990. Bureau of Public Roads Papers, Record Group 30, National Archives and Records Administration, Archives II, College Park, Maryland. Records of the Pennsylvania Department of Highways, Pennsylvania State Archives, Harrisburg, Pennsylvania. Edmund N. Bacon Papers, Division of Rare and Manuscript Collections, Cornell University, Ithaca, New York. Not only well written, but truthful as well. What is the solution here? If the Schuylkill Bike Trail can be constructed over the river itself, it may be quite possible to build the roadway over the river, at the Grays Ferry ave area and why doesn’t this highway have a third lane to merge smoothly. Incorporate Vare Avenue as part of the highway, extending it to 3 lanes each way to prevent the daily jam up. The summary here is NOBODY in this government has the intestinal fortitude to make it happen. With respect to the jam ups from City avenue to King of Prussia, why is a railroad right of way not converted into the highway. How about a highway running over the train lines beginning at Girard Avenue and running over the rail lines to connect I 95 near the Betsy Ross Bridge. Nobody has the the will to take the lead, that is why you and I will face daily gridlock in Philadelphia. AS a young child living in conshohocken, many summers were spent playing along the construction route, climbimg equipment, and cadging cold water from the construction workers. It was beautiful terrain, and lots of dynamite tore it apart. Just across the matson ford bridge on the west conshy side was a very large rock;Memorial Rock I think was its name,to honor Washingtons encampment there for a week before heading off to Valley Forge.Right in the path of construction !! Where is that rock today? I would dearly love to know.